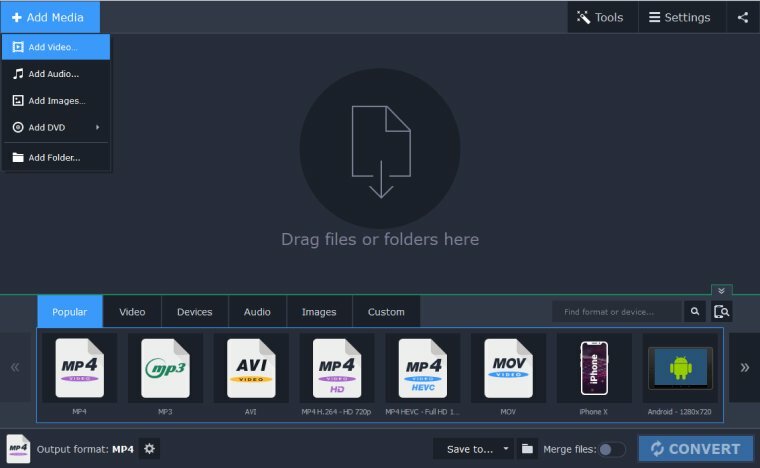 Wondering how to convert MP4 to MOV? If you don’t want to run the risk of installing unknown freeware converters, take a look at this simple and effective web service. 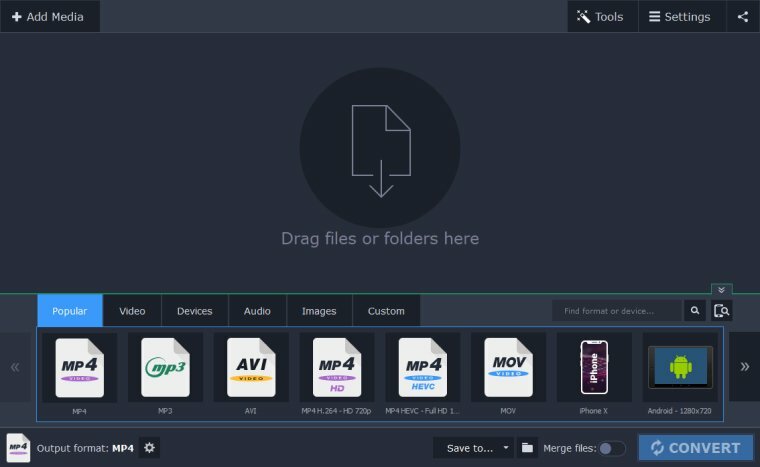 Transfer your video or audio files to the most popular formats in no time. 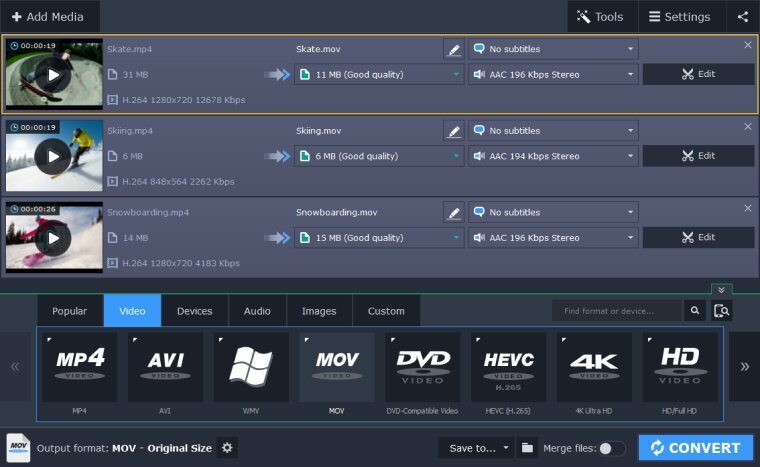 Our free MP4-to-MOV converter is really easy to use - here’s all you have to do. Choose MOV as the target format. Is your MP4 video file over 100 MB? Try our premium desktop app! Converting MP4 to MOV online is easy and you don’t need to understand how the conversion process works. But web services usually have restrictions on the maximum size of files you can upload. So if you have rather large videos but don’t want to be overwhelmed with complicated information, there’s one software solution that’s almost as easy to use as the web service – SuperSpeed Video Converter. With its intuitive interface and impressive capabilities, you will have no problems converting as many large files as you want. Simply download the program and follow the guide below to learn how to change MP4 to MOV in just a few minutes. Launch the downloaded installation file and follow the on-screen instructions. After the program is installed, double-click the desktop icon to run it. Click the Add Media button in the top left corner of the program and from the drop-down menu choose Add Video. In the new window that opens, locate the MP4 files you want to convert, select them and click Open. Alternatively, you can simply drag and drop your video files from their folder to the program window. To set the output format, click the Video tab and select the MOV group of presets. In the drop-down menu, you will be able to choose a preset that suits your needs. To ensure the best quality and keep the original resolution of the video, choose the Original Size preset. Choose the output folder by clicking the Folder icon in the bottom of the interface. Then click Convert and wait for your files to be converted. When the conversion is complete, the folder containing your files will open automatically. Fast and effective conversion is really easy with the SuperSpeed Video Converter. 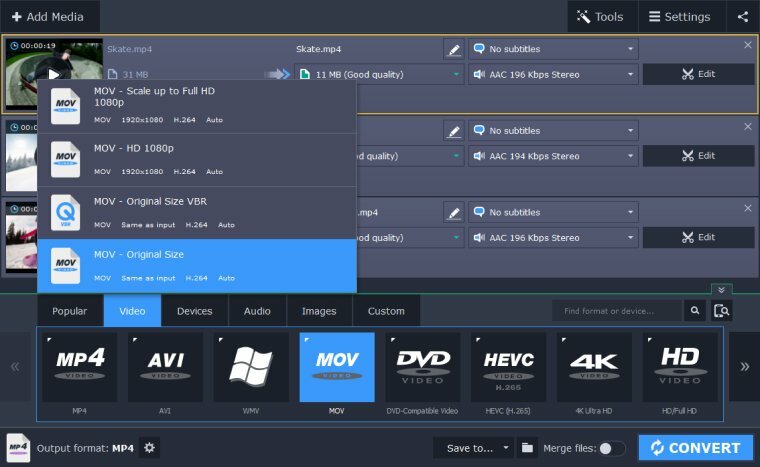 Convert between 180+ different media formats using just one app on PC or Mac. Download the program and try it for yourself!